This unit, designed by G4COM, is a very useful "tool" for adjusting receiver preamplier stages for optimum noise figure. It is very simple to use and easy to make. 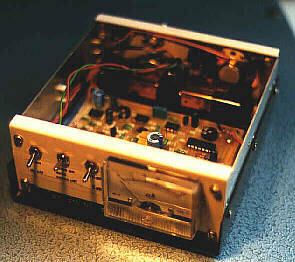 A complete kit is available in the UK and the writer's example shown here was built up from one of them. However, it can be made from "scratch" at home but the nice pcb included in the kitset was too much for your scribe to resist! The front panel switches are (left to right): power on/off, noise on/auto/off, full scale meter range 5dB/15dB. 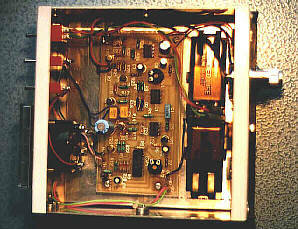 The meter shows the relative noise figure of the amplifier under test. The unit produces wideband noise across the spectrum from DC up to the high UHF bands. Microwave noise output at 10GHz is also possible as the unit provides a voltage to drive a microwave diode noise generator. If the noise source output can be accurately established, then an absolute noise figure measurement can be obtained. Most amateurs, however, are happy enough to see relative improvements made to their receive system and can arrange to get absolute measurements at various amateur technical gatherings such as the regular RSGB Microwave Round Table meetings. As I said above, this little unit will get you into the ballpark, ready for that session on the Hewlett Packard! The general idea of the system is to feed the audio output of the receiver under test into the Noise Comparator while the noise generator output of the unit is fed into the receiver rf stage. The noise figure of the receive is a measure of the ratio between the rectified audio voltage across the terminals of the Comparator's monitor speaker, with and without noise generator input. Simple noise measuring devices often use manual on/off switching of the noise generator. The G4COM noise comparator switches the noise on and off automatically, at a rapid rate. The front panel meter indicates the difference between the two states. Adjustments to the preamplifer under test produce a HIGHER meter reading as the noise figure is LOWERED, indicating a bigger difference between the constant output of the internal noise generator and the operator-adjusted internal noise produced in the preamp itself. The two, switched ranges (5dB and 15dB full scale) make even low noise figure readings possible. The heavily damped meter indication is quite stable enough to notice fractions of a dB change with adjustments. It essential to operate the receiver without AGC, i.e. on the linear portion of its gain curve, when using this equipment. Thus noise blankers and agc must be disabled. FM receivers must not be driven into limiting. The switching voltage in the unit is derived from a simple astable multivibrator operating at 30Hz, while the internal noise generator uses a transistor operated as a diode in reverse breakdown, its dc bias voltage being controlled by the multivibrator. The meter reads linearly in dB across its range. The receiver under alignment is automatically terminated at 50 ohms at its antenna input when connected the Comparator's noise output connector.